On the occasion of the hundredth anniversary for women's right to vote in Denmark, Maj Hasager and Marie Thams has let their artistic practices join forces in an exhibition project, where gender and political positioning are the central aspects, and where the action and today's feminism are brought into play. In the exhibition they let their work – in all their difference – complement each other and together create a whole. The exhibition thus consists of sound pieces, slide projection, archival material and a large spatial installation on the ground floor, as well as historical fragments of text blending with visual, symbolic gestures in Viborg Kunsthal's front garden and a returning performance in the centre of Viborg. 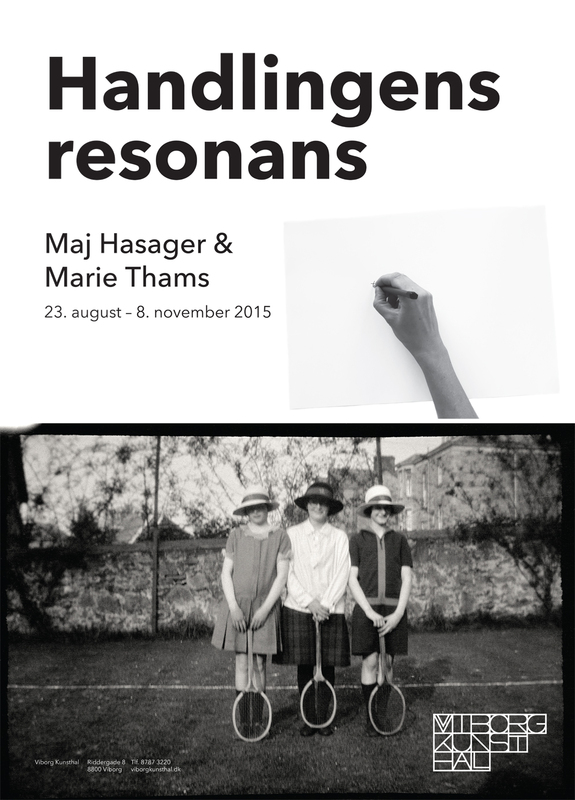 Both artists work continually with political issues: Where Hasager departs from extensive archival research and material in a critical and information-driven view on the writing of history, Thams' approach is a more abstract and visual exploration of her own bodily and political experiences. As the title puts forward, the exhibition is about taking action, and about the resonance that action creates. It is a clean cut that opens all gates – in order to hold all actions accountable: the individual action, the collective action, history-writing's action, the artists' own action, the Kunsthal's action – even non-action and its resonance is examined. Because even when we do not take action, we act. Read text about the exhibition Handlingens resonans (in Danish - soon ready in English) - "Den umulige ikke-handling" by Maria Bordoff.